Holidaying with children can be stressful: Aiming to please everyone can be hard, so when you find a destination that ticks all boxes for the family, you’ve got to share it! 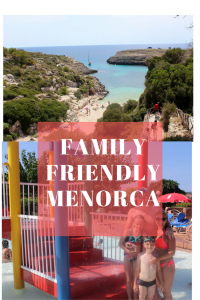 We travelled to Menorca this year and we found 10 brilliant reasons Menorca is perfect for families. The chances are you’ve already seen an Menorcan beach, illustrating the perfect beach. They have white sand, turquoise seas and beautiful scenery. They are in may ways comparable to those in the Caribbean. The beautiful sand was perfect for our children who could build sandcastles all day long, and it also saved a lot of hassle of kids not complaining about walking along stony beaches! Son Bou is the largest beach on the island, and probably one of the more livelier places, with a couple of beach bars along it. It did, however, have an inflatable bouncy course moored a couple of hundred metres from the beach, which thrilled my kids no end! 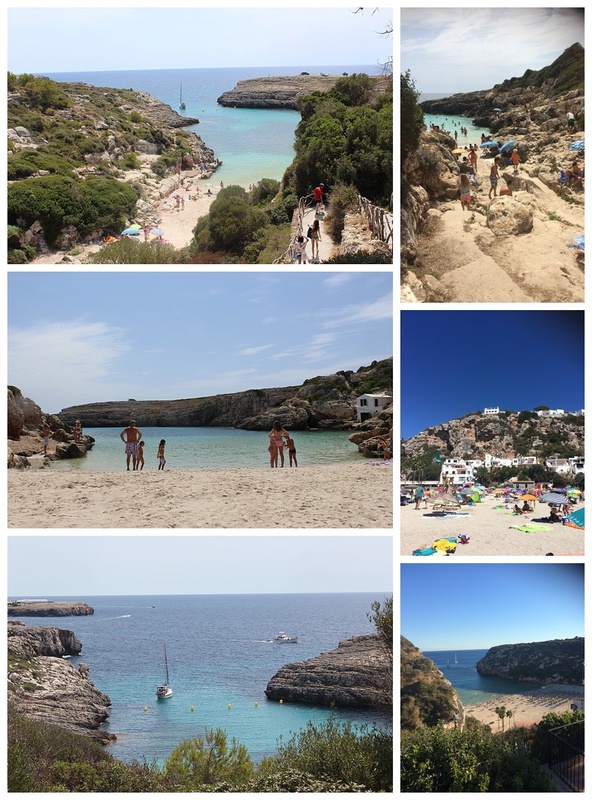 However, Menorca is more famed for the postcard-perfect coves. We spent a lovely day exploring those in and around Binidali. 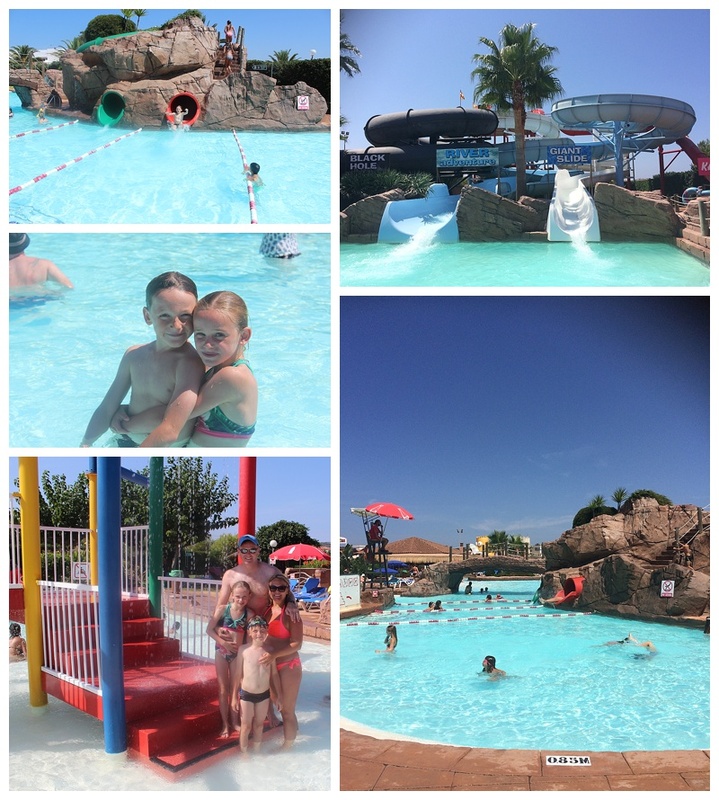 We found them all perfect for swimming, relaxing and the children loved clambering around the rocks. Usually there was a place for a cool down beer / sprite nearby on the road which is always welcome! The sea is just divine, if you were to conjure up in your head how you thought the med would be, Menorca would be just that. The waters are crystal clear and calm – perfect to snorkel in. Added to this, many of the beaches gently slope off so they remain shallow for quite a way. These shallow waters heat quickly in the summer sun, making them ideal for the kids to play in. Apparently Menorca has 300 sunny days a year. Does that sell it to you?! 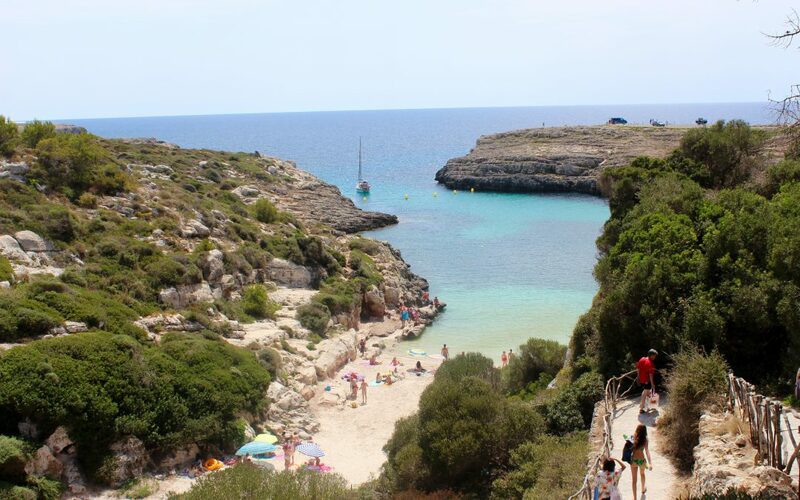 To add to that, the average temperatures in Menorca June – September are the high 20s. Whilst we were there, the mercury hit over 30 degrees every day, whilst it was baking hot, it was not the uncomfortable heat we had experienced in Turkey and Cyprus. That said, we still were extremely careful in the sun. 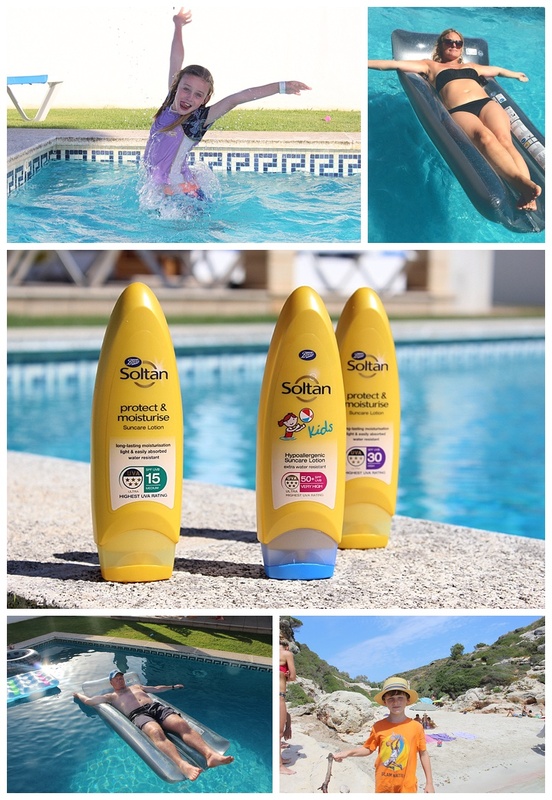 Having met Boots Soltan earlier this year at Britmums, I was aware that being in and out of the pool can actually double the amount of UV reflected, therefore the kids were always protected (usually in factor 50 – I take no chances!). Additionally, instead of wearing a T Shirt they always had UV vests on. Once T shirts are wet, they become opaque and actually offer no protection. The added benefit of Soltan is they protect against both UVA (the most damaging) and UVB rays, and have a 5* rating, so you know you and your family are using a fantastic product. 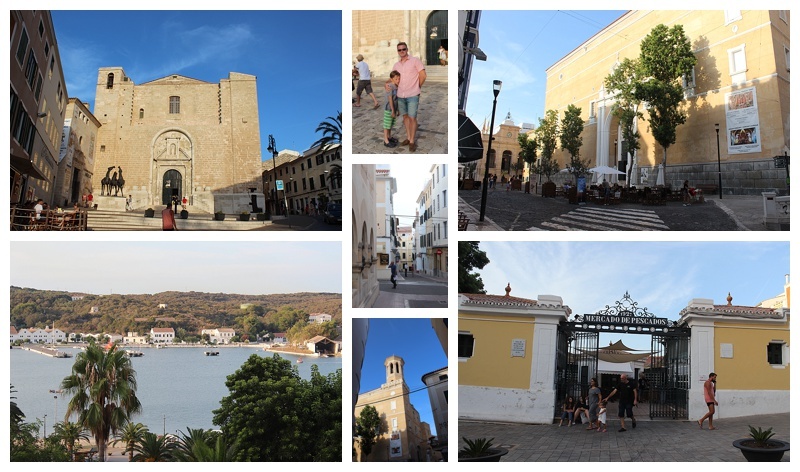 Menorca is a popular island with many Europeans, therefore accommodation is plentiful. We chose to stay in a private villa but when researching we found all-inclusive hotels, apartments and B and Bs to fit all price ranges. I advocate long haul travel with children, and have travelled to America and Canada with them, however, you cannot deny the easy of short flight! With the flight times at roughly just over 2 hours from London, the journey is pretty easy. I still have that feeling that I can’t believe somewhere so different to the UK is only a couple of hours flight away! As I mentioned before, it’s immensely popular with families from all over Europe, and this obviously means there are a lot children there! This has the positive impact that your children cannot fail to make a holiday friend or two. The joy of watching them run around in the evenings with their new found friends and then seeing them on the beach the next day is just fabulous, and what holidays are meant for. 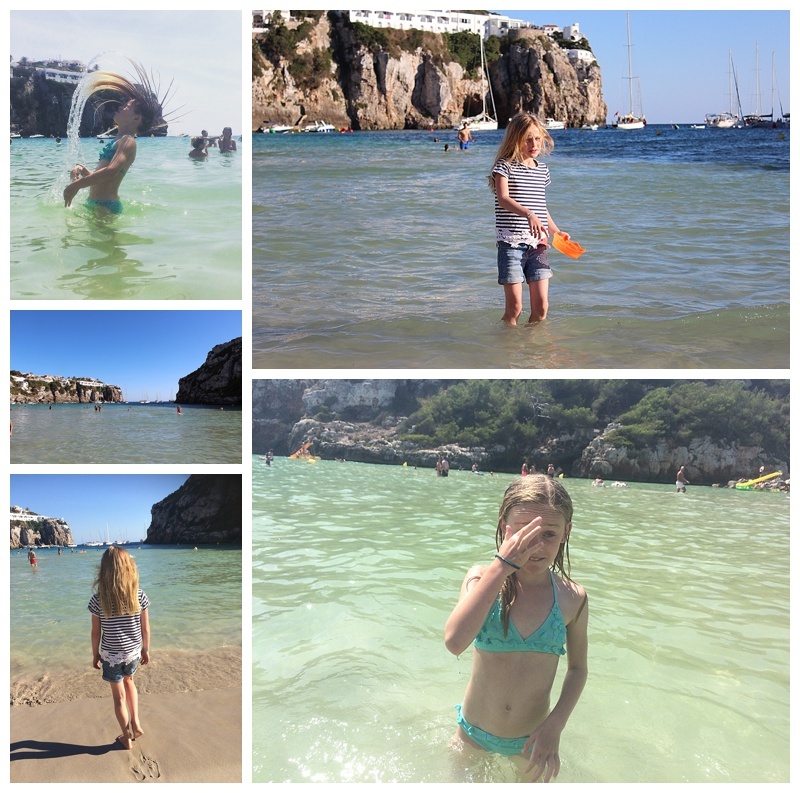 We all choose things we like to do as a family, the husband I chose exploring coves, whereas the children had a firm idea that they wanted to visit a waterpark! There are a couple on the island, but after some research, my daughter decided the one she wanted to visit was Aqua Centre, near the Cituadella. To be honest, it didn’t thrill me the thought of going, but I was pleasantly surprised. The park was reasonably priced, clean and plenty for the kids to do. Sure, it wasn’t like the mammoth parks over in the States, but there were 4 ‘big slides’ for the older children to enjoy and an area just for the under 11s (which to be honest, my 8 and 10 year old enjoyed just as much as the more adrenalin-fuelled rides!). Added to this, there was a pleasant enough pool area, and sun loungers (an extra charge) for the parents to lie on and catch up on holiday reading! It was a great way to spend the day, and I know the kids had a blast. We chose to go on our final day of our holiday as we had a night flight home, and there were also changing rooms and showers we could use so we were ready for our flight home. One evening, we chose to go to Mahon, the capital city, for supper. On a warm evening in August, we found an elegant city buzzing with the many pavement cafes. We started the evening off with a drink in the Plaça d’Espanya, overlooking the port, and then explored the streets until we found a delicious tapas bar tucked into one of the side streets. There are plenty of lovely shops to work the beer and food off, and to be honest, just walking around and soaking up the architecture and laid-back atmosphere is all you need to do here. I love Spanish food: Seafood, tapas and sangria is probably my ideal menu. I was never stuck for a menu choice, and the food was always delectable. 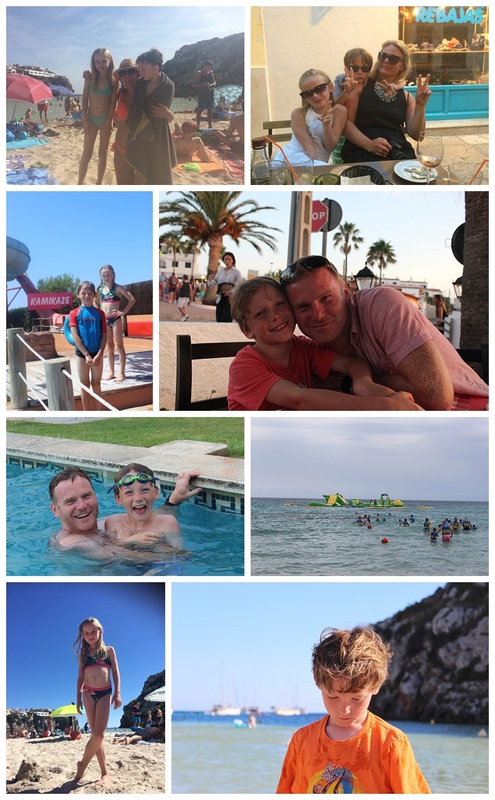 Obviously, it can be more tricky for the children, but everywhere had a ‘chicos menu’, and over the course of the holiday they ate pizza, calamari, steak, fish and plenty of chips! Children and their varying taste buds are certainly catered for in Menorca. This was the biggest winner, as a family we felt really welcome. No one batted an eye at children being in the restaurants late at night, and all enjoying meals as families, in fact it was positively encouraged. The local beach had a playground and the larger beaches all had showers and loos, making a family trip to the beach a lot more comfortable. Go discover this wonderfully family island in the Balearics, I promise you won’t be disappointed. Disclaimer: I have worked in collaboration for this post, and sent products to try, however all thoughts and images are my own.